Lots of action and interesting details about traveling and life in India! When aspiring photographer Dylan Moore is invited to join his best friend, Rohit Lal, on a family trip to India, he jumps at the chance to embark on an exciting journey just like their Lord of the Rings heroes, Frodo and Sam. But each boy comes to the trip with a problem: Rohit is desperate to convince his parents not to leave him behind in Mumbai to finish school, and Dylan is desperate to stay in India to prove himself as a photographer and to avoid his parents' constant fighting. Keeping their struggles to themselves threatens to tear the boys apart. But when disaster strikes, Dylan and Rohit realize they have to set aside their differences to navigate India safely, confront their family issues, and salvage their friendship. 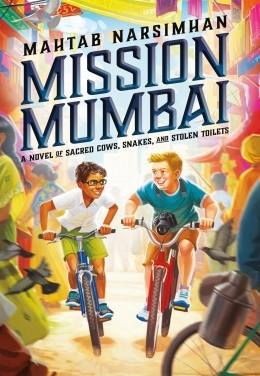 Mission Mumbai, written by Mahtab Narsimhan was published by Scholastic in 2016. The details of traveling in India are so interesting! I enjoyed all the descriptions of food, customs and cultural traditions woven into this story. Did I mention the food? I appreciated all the mentions of typical Indian foods and meals (you can find two of the author’s favorite recipes here). There’s never a dull moment in this novel, as the two boys explore, facing challenges that test their friendship. I wanted a clear shot but there were too many people blocking the way. Clutching a weapon that was highly inadequate for this dangerous mission, I crept toward the beast. Definitely consider reading this to study how to use authentic details to bring a setting to life. This book provides a different spin on the classic middle grade friendship issues, showing how the friendship between the two boys deteriorates when they are preoccupied with their own goals and family problems. We narrowly missed colliding with a cyclist transporting cages of screaming hens, a vendor with a tall stack of egg trays on the carrier behind him, and a lamppost. It was scary and thrilling all at once. This is a great read for students who are interested in adventure and travel. I found it interesting the way the author depicted the boys interacting with people of all different social classes, showing that everyone had their own problems and joys. For students who have never been to India, this book provides a great snapshot of what life might be like. The road was submerged in at least two feet of water. Plastic bags, bottles, banana peels, and other unidentifiable debris floated on the floodwater’s pockmarked surface. Everything was soggy and limp in the relentless downpour. Check out this interesting interview with author Mahtab Narsimhan and go here for some discussion questions and activities. More middle grade book reviews are waiting for you for Marvelous Middle Grade at Greg Pattridge's blog. This lovely rhyming book is perfect for starting off the school year and to keep on hand in the classroom for students to explore. I think I will have to buy a copy for my classroom. 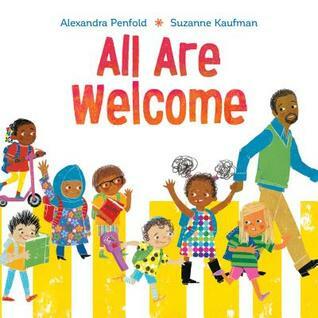 All Are Welcome was written by Alexandra Penfold and illustrated by Suzanne Kaufman. 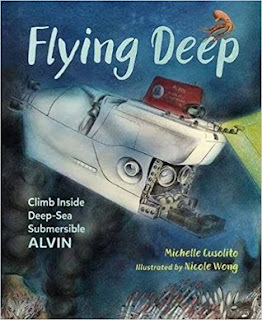 It was published by Alfred A. Knopf in 2018. Pencils sharpened in their case. Bells are ringing, let’s make haste. School’s beginning, dreams to chase. A lovely example of a rhyming story with a positive message for children. The repetition of the line "All are welcome here" is so effective. I can see myself using this throughout the year as a reminder, or even to post in the classroom. Brilliant word choice! I especially liked the way the illustrations show diversity & inclusion with different skin colors, clothing, and family groupings. This book upholds all the values that we see in a strong public education environment. There are opportunities for talking about individual differences, diversity, what it means to feel safe, how each child has their own unique story and how we can learn from each other. I plan to read this to my kindergarten students early in the year! Draw and Share: What is your special talent? What could you teach to others? Discuss: What is your favorite page in the story? Why? Make: Have students write the words "All Are Welcome Here" as a banner to put up in the classroom. Draw: Draw a picture of what you could do to make a new student feel welcome. Create: Use yarn to create welcoming hearts for the fence at your school playground (see inside covers). It was hard to return this one to the library -- I just may have to buy my own copy! Just when it feels like Daisy's deal with the universe is unravelling, she finds out that love and strength can come from surprising places... and that maybe "normal" isn't all it's cracked up to be. 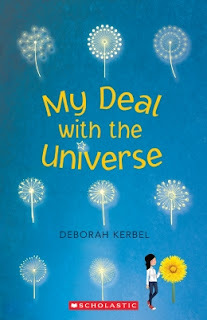 My Deal with the Universe, written by Deborah Kerbel, was published by Scholastic in 2018. Daisy’s take on her life drew me into the story right away. I loved how hard she tried to help her brother, her interactions with her new friend Violet and the cool vine-covered house she and her family lived in. I felt all kinds of emotions right along with Daisy as I was reading the story. This is a book I’d definitely read again. What a great book to read as a mentor text for learning about voice and character! As I was reading, I felt like Daisy was a living, breathing teenager talking to me. I enjoyed thinking about the characters in this story and how word choices and phrasing bring out their personalities. Also, if you’re trying to understand what editors or agents mean when they ask for “quirky,” I’m pretty sure this is a prime example. The thick layer of vines somehow manages to keep the rooms coolish in the summer. And warmish in the winter. Mom says the vines give our house insulation. I secretly think it’s one of the reasons why Dad let them take over. He’ll do anything to save money on the electricity bill. It’s nice to read a middle grade novel where the parents are part of the story and not banished or dead. Family is important to the main character, even though she doesn’t always agree with their decisions. This story reminded me of the importance of communication between family members. Have you ever felt like someone’s scribbled all over your insides with a fine tip Sharpie? That’s how I feel right now and I want everyone to know it, so I dress in all black from head to toe. Looking for another good book to read this summer? Check out the offerings for Marvelous Middle Grade May over at Greg Pattridge's blog.